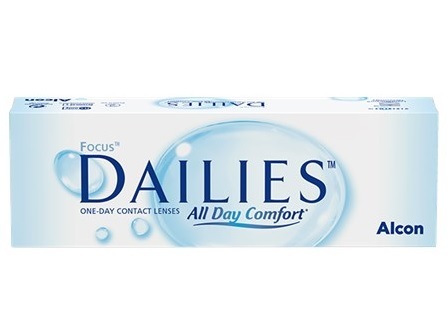 Focus Daily lenses now contain a built in moisturiser that is released throughout the day for all day comfort. With Focus Dailies cleaning, rinsing, disinfecting and protein removal are a thing of the past. You simply wear fresh new lenses every day...nothing could be simpler. Focus Daily lenses have a 69% water content. 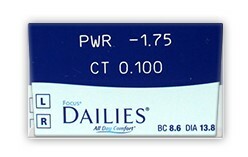 New: We have introduced a new daily lens for dry eyes and even more comfort - Crystal Aqua Daily. A great replacement for 1 Day Acuvue Moist and Focus Dailies - at almost 1/2 the price! Focus Dailies have a unique ultra-thin edge design that provides exceptional comfort right from the start. You`ll feel the difference from the moment you put them in and enjoy the comfort all day long. Focus Dailies now also contain Aquarelease for all day comfort. Because you wear fresh, new lenses every day, Focus DAILIES are always at their best. Your vision remains crisp and clear with healthier, happier, more comfortable eyes. I used to use these via Boots opticians. Much cheaper here and a much faster service. A comfortable lens to wear. Thank you! I will definately be coming back to you. Currently using these lenses now mainly because they`re the cheapest. I will not be buying them again as they dryout too quickly and seem to break/split whilst wearing them causing major irritation, Can be extremely dangerous when driving. Also found the acuity/clearness of vision can be poor when they become dry after 5 hours. The only plus side in ordering these is that they are relatively cheap and the order is sent out very promptly, may be due to them always having the lenses in stock. I`m now of the opinion that my eyesight is far too valuable to buy sub standard lenses that have on several occasions disintergrated or split in my eye. I will not be purchasing these lenses again. Although I absolutely love the lenses, and have used them for years,my problem is occasionally you get a,batch with so much glue on the lids that by the time you battle to remove them, the lens is useless. I have just had yet another batch where six lenses have been consigned to the bin. I have re ordered another batch, and if these are the same, I will be rethinking my next order. I've found these the most comfortable of several different lenses I've tried by different manufacturers. I only use them for sport (2-3 hours) and can take them out and reuse them several times if I'm careful. I've only ever had one break up in my eye so my advice is don't get put off by the outraged foaming-at-the-mouth 1 star reviews on here until you've tried them yourself. I have been wearing soft contact lenses for over 20 years. Focus Dailies All day comfort contact lenses are the most comfortable and I have not experienced any no discomfort. Highly recommend these contact lenses and these are the most commonly prescribed by opticians. These lenses are very comfortable, and the delivery of them was fast. Recommended!